Business trips are something professionals enjoy taking but never fully take advantage of during their working career. Everything from Industry conferences to recruitment meetings to on-site visits and more is time taken away from home. What’s not often discussed by savvy business leaders is that business trips are also an opportunity for you to enjoy a low-cost vacation. Known as “blesiure,” combining a work trip and a vacation, is one of the newest approaches’ professionals are making their office time a win-win. Regardless of your destination, there are many ways to turn your business trip into a memorable vacation. Here are a few tips from our experts at Andavo Travel, who have years of experience booking travel for thousands of business professionals. Follow these and your next business trip will be the blesiure experience you desperately need. Before your vacation even begins, plan for maximum enjoyment. Ask your employer or hotel management for a hotel that’s near some of the most popular sites. If you don’t ask, then you’ll miss out. Along with a great hotel, make sure that you get a room that includes an incredible view. 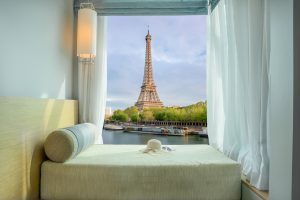 If you have a great hotel room, then you’ll enjoy your trip even if you’re confined to your hotel room your entire stay. You have to eat, so why not make it an experience. Forget the quick bite you typically had late at night after all-day meetings—make reservations ahead of time that you plan on keeping. These meals will quickly become a relaxing experience that you’ll look forward to every day. Many business professionals are maximizing their stay by staying an extra day or two. A recent survey found that two-thirds of millennials and a quarter of older travelers are regularly extending their work trips to enjoy some me-time. This extra time can help you focus on work knowing that you’ll have time for play afterward. Meetings shouldn’t be boring—make the most of your time by planning meetings at must-see locations. Whether it’s in Central Park or at a beachside restaurant, these locations can help inspire your work and also impress your business partners. Even if you’re staying an extra day, planning some downtime can benefit your time on-the-clock. We suggest including vacation elements throughout your trip whenever possible. Take a phone call while you sit next to the pool. Take a sightseeing tour before your next meeting. A few hours of downtime every day can make any business trip feel like a vacation. As tempting as it is to stay inside with some in-room dining, room service, and your television remote, staying cooped up inside all day can drive any person crazy. Take frequent breaks and enjoy the outdoors will do wonders for your morale and creativity. Go on a hike at a nearby trail or visit a nearby tourist attraction. These little moments are what will make your business trip count. Don’t waste time sleeping in– wake up early. Since most business trips are full of events that happen during the afternoon and at night, make the most of your mornings by waking up early. Whether you want to break a sweat in the hotel fitness facility or grab a great breakfast, we suggest you make your mornings count. While a business trip is most likely not going to turn into a full-blown vacation, it’s the best way to get a little personal time out of your work trip. These blesiure trips let you explore new cities you usually can’t visit while working to better your business. If you’re a travel advisor looking for creative ways of making your client’s business trips count, contact Andavo Travel. Our travel advisory services provide you with the latest travel information to help your business grow. Get in touch with us today!